In response to the Customer Service requirements the Accessibility Training subcommittee was struck in January of 2016, its mandate is to adapt the training modules created by the Access for Ontarians with Disabilities Act (AODA) with content specific to Manitoba and to work on an in-person training facilitation guide. Training modules are scheduled to be released in early 2017 at all institutions. CONSULTATION PROCESS The Accessibility Steering Committee enlisted the support of the Institutional Analysis and Planning department to conduct a research survey on potential barriers they had encountered, or felt others had encountered. An electronic questionnaire was sent to college staff, current students and individuals who had graduated from the college within the past five years. For the purposes of data reporting, alumni and students were grouped as ‘students’. A total of 11,570 emails were sent out to current active students, graduates of 2011-12 to 2015-16 academic years and current staff. In total, 780 individuals completed the questionnaire. The aggregate results of this survey are included as Appendix A. In addition to this survey, as part of the curriculum in the Comprehensive Health Care Aide program, students completed an exercise that identified physical barriers at the college’s Victoria Avenue East Campus. The results of that exercise were shared with the AMA committee and considered when developing the implementation plan. A preliminary review on Disability Services has been completed with a final report planned for February 2017. This report will provide a pathway towards a renewed accommodation approach to support students at ACC. 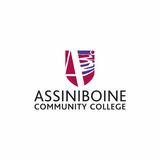 OVERVIEW OF ASSINIBOINE’S PROGRAMS AND SERVICES Assiniboine Community College (ACC) has been providing exceptional learning experiences for over 55 years. For staff and students alike, ACC offers unparalleled learning environments and responds well to the demands and requirements of the Manitoba labour market. Instructors follow the philosophy of ‘learn by doing’, combining theory with hands-on learning inside classrooms, labs, kitchens, shops, fields and the college’s Sustainable Greenhouse. ACC is an accredited college with the Government of Manitoba and offers more than 40 unique diploma and certificate programs across a variety of disciplines including culinary arts and hospitality, business, agriculture and environment, health and human services, trades and technology. The college also delivers apprenticeship programming in a range of skilled trades disciplines and offers a variety of programs to students through distance delivery. The college welcomes approximately 3,200 full-time students each year. With campuses in Brandon, Dauphin and Winnipeg, ACC provides comprehensive education opportunities throughout Manitoba. The college also partners with many communities and organizations across the province to deliver customized education and training. A variety of assistive technology and ergonomic equipment is available to use in the Learning Curve and Test Centre. Read and Write Gold, an assistive technology, is available free for all ACC students. Learning Curve and Test Centre staff are capable of training students on a variety of assistive technologies and learning strategies. Workshops and presentations delivered by the Learning Curve are provided to the staff and students in accessible formats. ACC Moodle course templates & online lesson templates use correct document structure and are accessible. Online supports for instructors and students included within folders in the Moodle course templates and tools are currently being checked, and accessibility problems corrected as needed. Some of the third-party online library tools have accessibility features, such as text read aloud and the ability to change font size. The library space is entirely wheelchair accessible. The Centre for Learning and Innovation utilizes a systematic planning process that considers universal design and accessibility to anticipate and mitigate potential barriers at the course planning, design and development stages. For example, they may identify multiple strategies to increase relevance and encourage learning; suggest alternate approaches to demonstrate learning or measure outcomes; identify supports required; and recommend alternate formats that may be required. Website » The college’s public website was redeveloped and launched in early 2015. The current website meets W3C (World Wide Web Consortium) WCAG Priority II compliance and HTML5 specification compliance. The website was built using responsive design, meaning it can adapt to all screen sizes. Further to the design of the site, there is an ongoing concerted effort to reduce barriers to accessing information, for example:  Eliminating the use of non-readable PDFs, instead supplying content read by screen readers.  Where possible, provide information in simple sentence structure using non-technical language.  Provide descriptions (alt tags) on all images. The Learning Curve is often quite crowded and therefore access to accessible work stations and computers with assistive technology can be limited. Students with learning disabilities often request private and quiet study rooms, which we do not have. More universal instructional design needed – this would lessen the need for formal accommodations and decrease barriers. Heavily scheduled programs can make it difficult for students with disabilities to access the support they need from the Learning Curve and Test Centre. Washrooms have been part of an ongoing upgrade to install handicap door openers to allow easy access. The parking lot at the Victoria Avenue east campus presents many challenges to persons with mobility issues, such as a lack of wheelchair ramps, the overall poor condition of the surface (e.g., potholes, uneven surfaces). The Victoria Avenue East campus presents a challenge due to its design and additions to the building over the years. Many areas can be accessed by persons with mobility issues, but in some cases have to take a circuitous route to get where they want to be, due to no allowance for persons with disabilities. Outdoor lighting at some campus locations is poor and presents problems for individuals with a visual impairment. Many reception areas are not properly designed for persons with mobility issues. In many instances the counters are too high or would not allow a mobility device such as a wheelchair to be pulled in close enough. At the Victoria Avenue East campus, only one elevator is wheelchair accessible. 1. Senior leadership team to identify Executive Sponsor and Chair for the committee. 1. Executive Sponsor and Chair of ACCâ&#x20AC;&#x2122;s Accessibility Committee will be identified by January 2017. 2. Executive Sponsor and the Chair will establish membership for the accessibility committee. 2. Membership will be finalized by February 2017. 3. Accessibility committee under the direction of the Chair, to develop draft terms of reference for the committee, including purpose, membership and timeframes. 3. Terms of Reference will be developed under the direction of the Chair, by April 30, 2017 and presented to the senior leadership team. 4. Secretary to the committee will be chosen and will set up ongoing meeting schedule, manage the agenda and establish format for communications and note taking. 4. Ongoing and effective communication will ensure information tracking and historical record of committee activity. Work plans will be developed including corresponding timeframes. 5. Annual report on accessibility plan implementation will be presented to senior leadership team. 5. 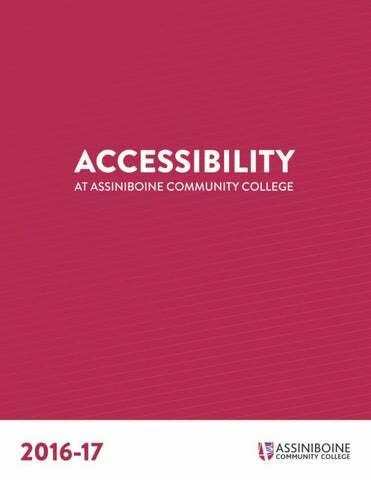 Annual reports will be delivered until completion of the Accessibility Plan. 1. Complete initial training plan by May 2017. This will demonstrate ACC’s commitment to ensuring all staff are trained. Look for other training resources such as education and training workshops available through SMD's Community Education and Training Department; Manitoba Disabilities Issues Office; and the marketAbilities Program. Model accessibility by providing training in multiple, accessible formats. 3. Educating faculty on accessible standards for course supports. Ensure employees (permanent, part time, contract) are aware of the Customer Service accessibility training requirement. The training plan will ensure that all staff receive consistent, ongong training on accessibility issues, especially emerging issues. Professional development regarding universal design will be developed for faculty. Staff will be prepared to respond to challenging or new situations in a respectful manner, while ensuring the dignity of the person with the disability is upheld. Barriers will be reduced to increase access to programs for students with disabilities. Increase awareness and understanding with respect to accessibility will help address attitudinal and systemic barriers. Employees will receive a certificate of completion once they have completed the training. 3. Training is offered in multiple formats on the Customer Service standard (e.g. online, in person, accessible handouts and materials). 4. Ongoing mechanism to ensure relavency of training aids as needed. ACC will be able to stand behind its commitment to accessibility with statistics regarding the number of staff who have completed training. Staff know how to create accessible documents and courses. Alternative course delivery methods are considered (e.g. e-learning) and developed through an accessibility lens. Materials will be evaluated and revisions made accordingly. 1. Update the ACC Style Guide to include an AMA section which touches on language use (clear language, no jargon), font style, font size, font colour, braille business cards, etc. 2. By June 2017, all current college staff will receive an introduction to the ACC Style Guide. Introduce ACC’s updated Style Guide to current staff via a department champion Include Style Guide presentation in new college staff onboarding sessions VP Academic to champion release of Style Guide to all college staff. All external documents will be reviewed by a department lead/champion and be approved before release (on an ongoing basis). By August 2017, all onboarding sessions will include an ACC Style Guide presentation. By September 2017, VP Academic will address all college staff about release of Style Guide. By end of June 2017, department leads will be selected and tasked with external document revision and approval. 3. Review college documents, publications and website with an accessibility lens. 3. All college documents will be revised and edited to adhere to new accessiblilty standards. 4. By June 2017, a list of areas of responsibility will be available to college staff. 5. Recommended resources and software will be used to create college documents in accessible formats. Create an online (accessible) request form for students/faculty/staff. Use the form to request accessible format materials. Completed form to be sent to appropriate people/areas of responsibility. Implement the use of a universal document format across all college departments (Microsoft word offers an accessibility check). A dedicated staff member within each college department will be responsible for ensuring use of universal document format. By June 2018, a consistent, stream-lined process for making college documents available in alternate formats will be used across all departments. » By June 2018, an online alternate format request form will be available to the college community. » By August 2018, a dedicated staff member within each college department will be responsible for ensuring use of universal document format. » By end of June 2018, entire college will use universal document format. All college documentation, emails, website, etc. will include the statement: “Available in alternate formats upon request.” Include link to form (on website and emails) or include contact info on paper copies. By September 2018, all college documentation, emails, website, etc. will include the statement: “Available in alternate formats upon request” and will Include a link to the alternate format request form (on website and emails) or include contact info on paper copies. Develop a effective accommodation process to support students’ accessibility needs. A process is developed and put in place. Determine the appropriate assistive supports needed and establish standards for consistency across the college and financial implications. The college will provide the necessary resources for assistive supports. 10. Educate faculty and support staff about student accommodation and the college’s role in providing assistive supports. 10. Faculty and support staff will be aware of the accommodation process. 11. Assess current college signage and make necessary changes to align with accessibility standards. 11. By September 2019, all college signage will be consistent with best practices. 1. Identify opportunities and develop support materials to educate staff and students about accommodation at ACC. Examples include student orientation and staff onboarding. 1. Staff and students are made aware of the collegeâ&#x20AC;&#x2122;s ability to accommodate. 2. Review marketing and recruitment materials to ensure they represent people with disabilities. 2. Marketing and recruitment materials reflect diversity and inclusion at ACC. 3. Review college policies and procedures to identify any gaps or required revisions. 3. Policies and procedures will be reviewed, revised and edited to ensure adherence to accessiblilty standards. New policies and procedures will be developed accordingly. 1. Identify the types of technology currently in use that would assist people with accessibility problems, determine whether they meet requirements. Research new types of technology. 2. Interior assessment to include doors, meeting spaces, offices, washroom and any other barriers to participation. » » 3. Exterior assessment to include entrance, sidewalks, parking lots and walkways. Provide resources to support the initiatives and actions as outlined in this plan. 3. The multi-year resource plan will reflect accessibility priorities. 4. Ongoing and accessible communications available to and from all stakeholders. Information about accessibility/barrier removal initiatives. Mechanisms for feedback, questions, concerns about accessibility and accessibility implementation plan. Prepare progress reports regarding adherence to each standard prior to required deadline. 5. Draft report completed in time to address concerns before adherence deadline and final report to Senior Executive. Continue to solicit feedback from the entire college community and appropriate external stakeholders to assess ongoing accessibility efforts. 6. A process is established to identify areas of improvement. In	college	documents,	language	that	is	unclear	or	unfamiliar	(such	as	jargon,	slang,	abbreviations,	and	acronyms)	has	been	a	barrier. Documents	have	not	been	available	in	needed	formats	(such	as	large	font,	or	braille,	or	electronic	versions	for	screen	reading	software). The	lack	of	assistive	listening	devices	or	amplification	systems	has	been	a	barrier. In	college	presentations	or	website,	uncaptioned	or	undescribed	photos/graphics	have	been	a	barrier. In	college	documents,	low	contrast	between	text	and	background	has	been	a	barrier. In	college	documents,	font	size	or	shape	has	been	a	barrier. In	college	documents,	design	elements	(such	as	too	much	color,	too	many	graphics,	or	not	enough	white	space)	have	been	a	barrier. Note:	The	percentage	is	the	combination	of	“strongly	agree”	and	“agree”	for	declared	and	undeclared	responders	status. Alternative	course	delivery	methods	(for	example,	e-learning)	have	been	inaccessible	or	unavailable. Online	forms	or	information	sources	have	been	a	barrier. Having	only	one	way	to	contact	someone	at	the	college	(example:	phone,	or	in	person)	has	been	a	barrier. Website	has	been	a	barrier	(such	as	design	elements,	font	size,	contrast/color,	or	undescribed	charts/graphics). ACC	does	not	have	adequate	equipment,	software,	technology	or	other	resources	to	support	people	with	disabilities. Learning	platforms	have	lacked	appropriate	accessibility	features. Software	has	lacked	appropriate	accessibility	features. 17% Emails	or	other	electronic	communications	have	been	inaccessible. Having	only	one	way	to	contact	someone	at	the	college	(example:	phone,	or	in	person)	has	been	a	barrier. ACC	does	not	have	adequate	equipment,	software,	technology	or	other	resources	to	support	people	with	disabilities. Emails	or	other	electronic	communications	have	been	inaccessible. Not	referring	students	with	disabilities	to	the	appropriate	services	has	been	a	barrier. Hiring	processes	are	not	been	accessible	for	people	with	a	disability. There	has	been	a	lack	of	awareness	of	the	possible	accommodations	for	disabilities	offered	at	ACC. Marketing	materials	do	not	represent	people	with	disabilities. Teaching	materials	do	not	represent	people	with	disabilities. Some	college	policies	or	procedures	have	been	a	barrier. Avoidance	of	discussion	related	to	disability	has	been	a	barrier. College	events	have	been	a	barrier	because	of	lack	of	planning	for	the	needs	of	people	with	disabilities. A	policy	has	been	given	as	a	reason	for	not	being	able	to	accommodate	a	need	related	to	a	disability. Students	with	disabilities	won't	get	accommodations	in	the	workplace. Accommodations	give	students	with	disabilities	an	unfair	advantage. An	applicant	who	discloses	a	disability	may	be	at	a	disadvantage	at	ACC. Some	people	question	whether	an	accommodation	is	needed. Staff	do	not	receive	adequate	information	to	assist	students	with	disabilities. Some	people	are	uncomfortable	dealing	with	a	student	with	a	disability. Students	with	disabilities	may	not	be	able	to	succeed	in	college	. Students	with	disabilities	require	too	much	time. Staff	accommodations	can	cause	trouble	in	the	workplace. Some	of	my	co-workers	and/or	my	manager	do	not	support	efforts	to	assist	students	with	a	disability. Staff	with	a	disability	cannot	do	the	job. Note:	The	percentage	is	the	combination	of	“Occasionally	observed	”	and	“Often	observed”	for	declared	and	undeclared	responders	status. Some	people	are	uncomfortable	dealing	with	a	student	with	a	disability. Staff	do	not	receive	adequate	information	to	assist	students	with	disabilities. Students	with	disabilities	may	not	be	able	to	succeed	in	college	. An	applicant	who	discloses	a	disability	may	be	at	a	disadvantage	at	ACC. Some	people	question	whether	an	accommodation	is	needed. Staff	do	not	receive	adequate	information	to	assist	students	with	disabilities. Students	with	disabilities	may	not	be	able	to	succeed	in	college	. Staff	offices	are	not	accessible	for	people	with	disabilities. Public	washrooms	at	the	college	are	not	accessible	for	students	with	disabilities. Signage	at	the	college	is	not	accessible	for	students	with	disabilities. Parking	lots	at	the	college	are	not	accessible	for	students	with	disabilities. Classrooms	and	meeting	areas	at	the	college	are	not	accessible	for	students	with	disabilities. Entrances	at	the	college	such	as	doors	are	not	accessible	for	students	with	disabilities. Public	spaces	such	as	common	areas	or	event	areas	at	the	college	are	not	accessible	for	students	with	disabilities. Note:	The	percentage	is	the	combination	of	the	sum	of	1	to	3	for	declared	and	undeclared	responders	status. Student:	Common	Type	of	Disability Question:	Please	indicate	what	type	of	disabilities	you	have. Provides professional development, training, support and resources to individual instructors and faculty teams in the development of contemporary, innovative and emerging approaches to teaching, learning and assessment. Creates and recommends course design templates, interactive activities and job aides for use by instructors and staff. Provides design support and training in the appropriate use of technology to enhance learning such as the use of video, audio and media for educational use. Administers and integrates learning management systems in cooperation with Computer Services. The Learning Curve A learning strategist and educational assistants are available to all students to develop strategies and to help them study more effectively during their college experience. Software and other technologies can help students with tasks like reading textbooks and writing papers. The learning strategist gives workshops and will do so for a class by instructor request. The Learning Curve also provides peer tutoring as a free service to students. Student Success Advisors Each Assiniboine Community College school/campus team includes a Student Success Advisor (SSA). SSAs are the primary contact for accessibility/disability services to students and applicants. The SSA will complete an intake, develop a list of appropriate accommodations, and then work with faculty and other college staff to implement and monitor the accommodations. Test Centre ACC’s Test Centre offers students, staff and the general public a quality and academically secure testing environment which enhances overall learning, achievement and student/customer satisfaction. Our primary testing room can accommodate 11 test takers at one sitting; this includes seven computer stations (XP and Windows 7 computers are available). Alternate facilities can be arranged for larger groups. Services include scheduling and invigilating VUE, Prometric and Certiport testing, admissions-based testing, distance education tests and exams, missed tests and exams, supplemental examinations and typing tests. The Test Centre works with instructors to arrange accommodated testing for students with an Accessibility/Disability services file. Arrangements can be made to write tests and exams at designated centres off campus as well. The Test Centre is also available for contractual work/private industry examinations, and for individuals requiring invigilation for exams from other institutions such as Athabasca University and University of Manitoba.